Lisa made this excellent vegetarian stir-fry tonight, based on a recipe in the always wonderful Fitness Food. Tofu is cubed and marinated in a mix of sauces and spices, and then quickly stir-fried with a plethora of veggies — we altered the recipe to suit what we had on hand — and thin egg noodles. This one will definitely make it into the regular rotation. Ooooh, now this is a good stir-fry! Of course it’s good, it’s from Fitness Food — I love that book. I obviously feel the same way — I inhaled! You might want to retract that if you ever want to run for President. Totally worth it. I’ll even admit to “doing shrooms”, as long as people realize it’s in the context of this dinner. 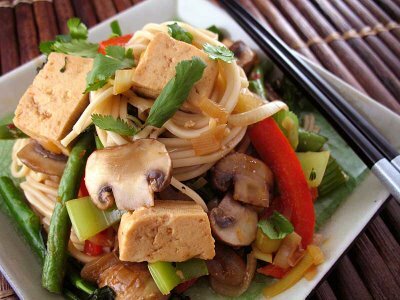 Tofu with Greens & Noodles in ’08! Combine the marinade ingredients in a non-metallic bowl, add the tofu and gently stir through. Cover and refrigerate for at least 30 minutes. Cook the noodles according to the package and set aside. Heat the oil in a large wok. Add the shallots, red pepper, and leeks and stir-fry for 2 minutes, or until lightly softened. Add the rest of the vegetables and broth. Cover and cook for 2-3 minutes, or until the vegetables are just tender, stirring occasionally. Add the tofu with the marinade and the noodles. Gently combine and stir until heated through. Garnish with the cilantro and serve. This obviously needs to go to Presto Pasta Nights! This entry was posted on Monday, April 14th, 2008 at 8:43 pm	and is filed under Fitness Food, Main Dishes. You can follow any responses to this entry through the RSS 2.0 feed. You can leave a response, or trackback from your own site. I just want to pluck those plump mushrooms right off my screen! I can’t wait to try this at home. It does look wonderful. Thanks for sharing with Presto Pasta Nights.